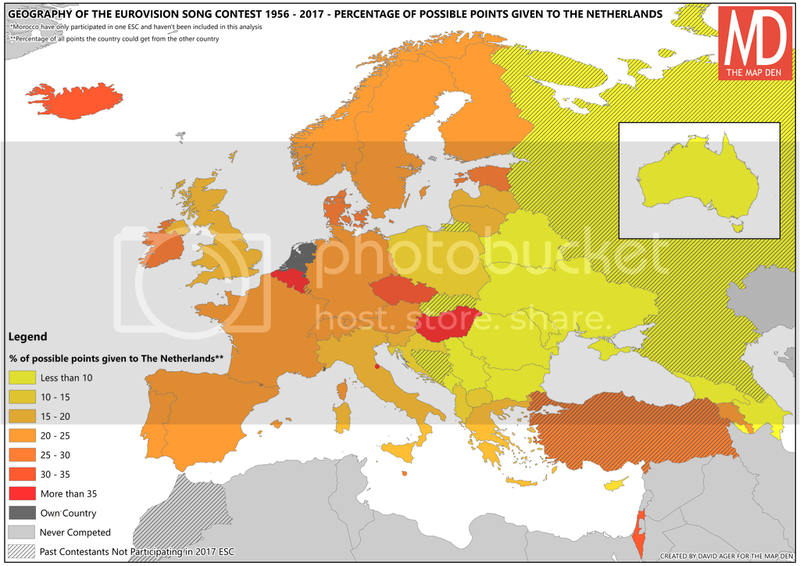 Trying to understand and explain the Eurovision Song Contest (ESC) isn’t the easy. Tune in on the evening of 13th May 2017 and in between overly-scripted hosts, thumping Eurodance and ballards, you’ll treated performances like Azerbaijan’s which includes a man wearing a horse’s head. 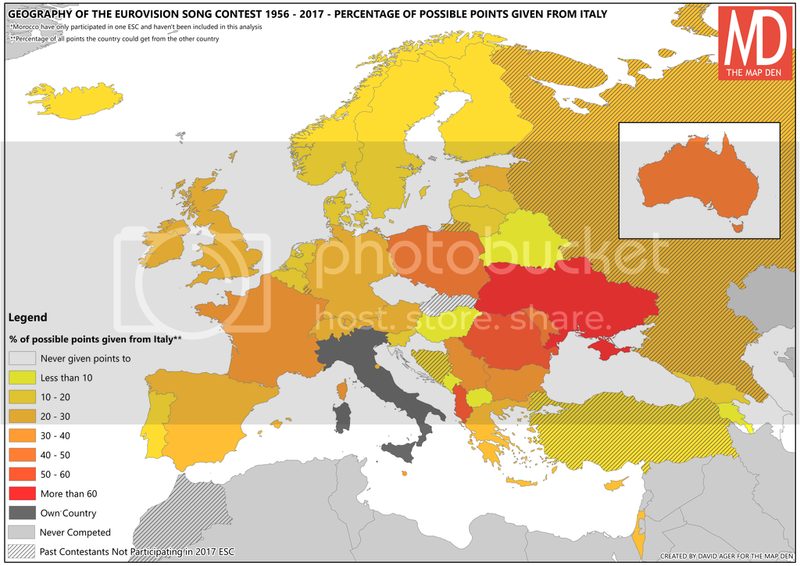 Meanwhile Italy is one of the favourites, despite having a man dancing in a gorilla suit- and this is par for the course each year in the ESC. 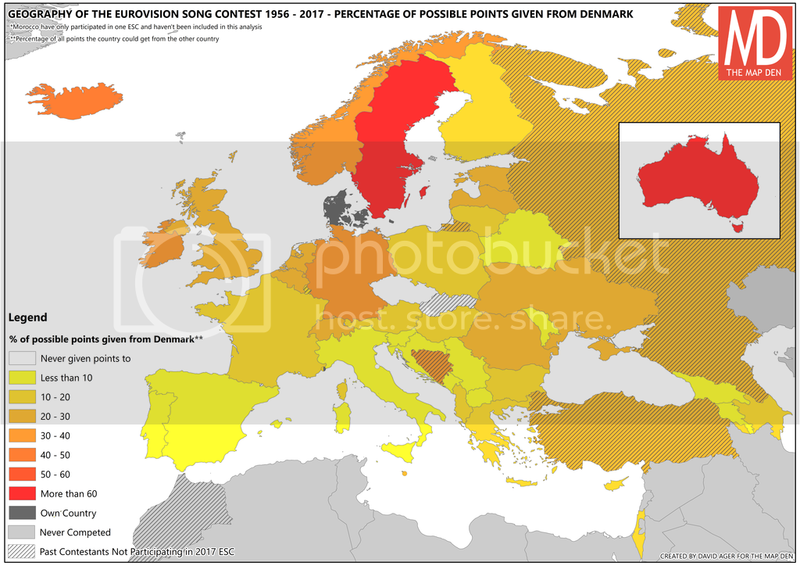 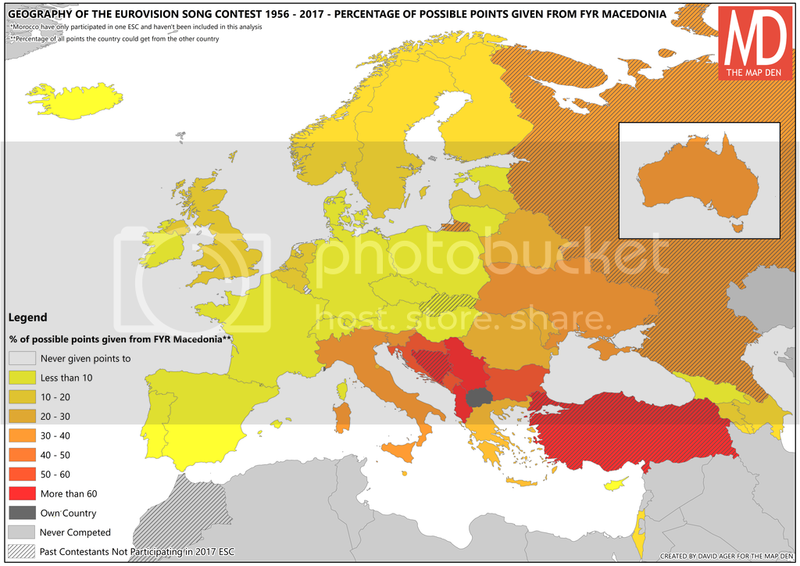 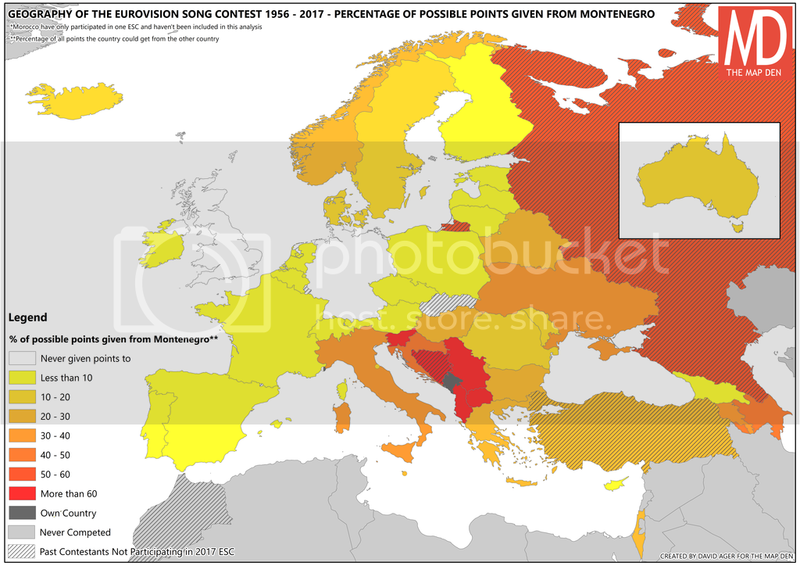 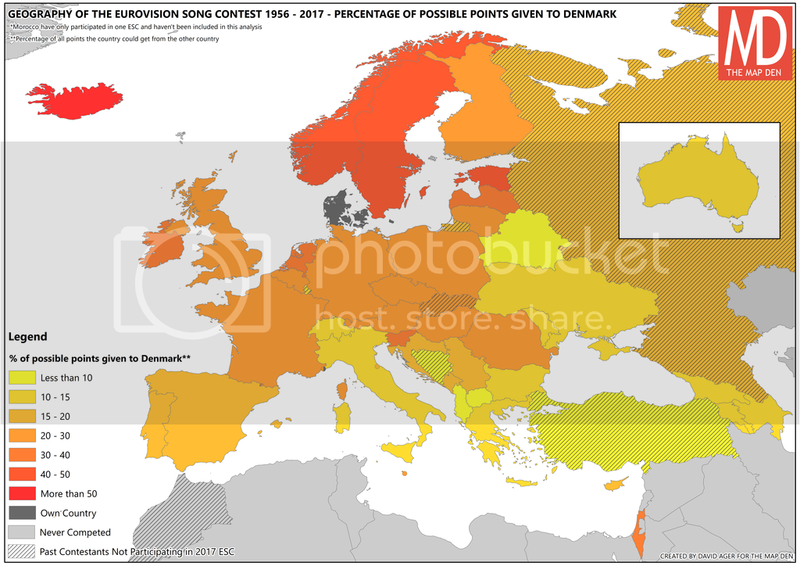 For those unfamiliar with ESC, on the face of it, this is an annual song contest where each competing European country writes and performs a song, which is then scored by a panel of judges and ‘televote’ by each country. 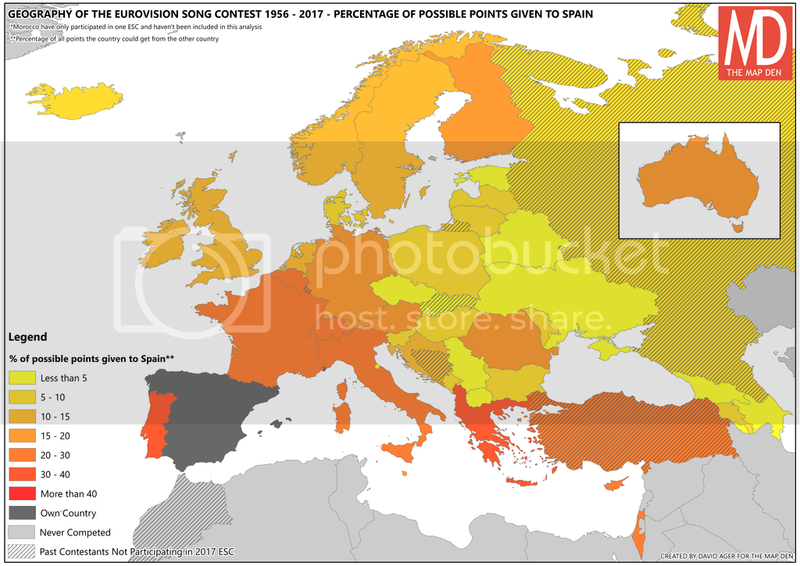 The country with the most points wins and gets to host the contest the following year. However, it is more than just that – there is a tradition for bubblegum pop to Eurodance, unusual lyrics and gimmicks, as well as the occasional decent song and breakthrough artist (e.g. ABBA, Celine Dion, Bucks Fizz). 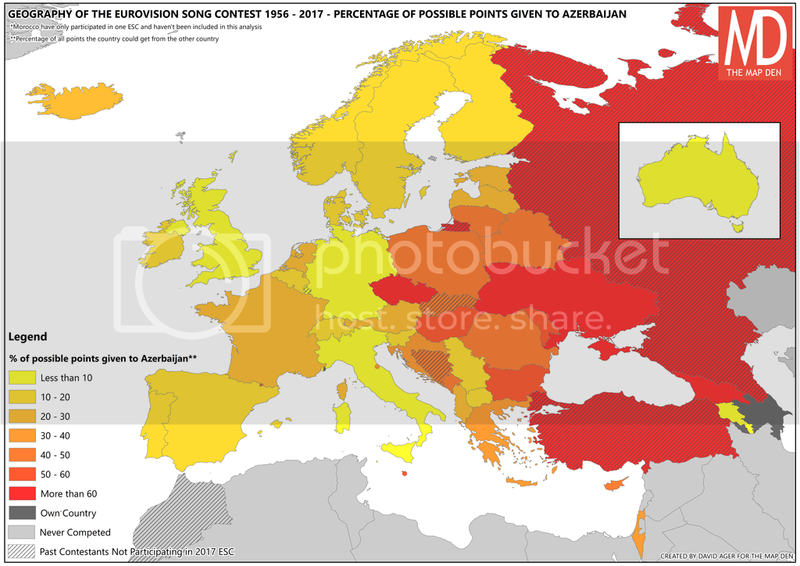 It has also become recently a political vehicle to show a country on the international stage, and this leads onto another tradition which brings some logic to the loveable madness – political/neighbourly voting. 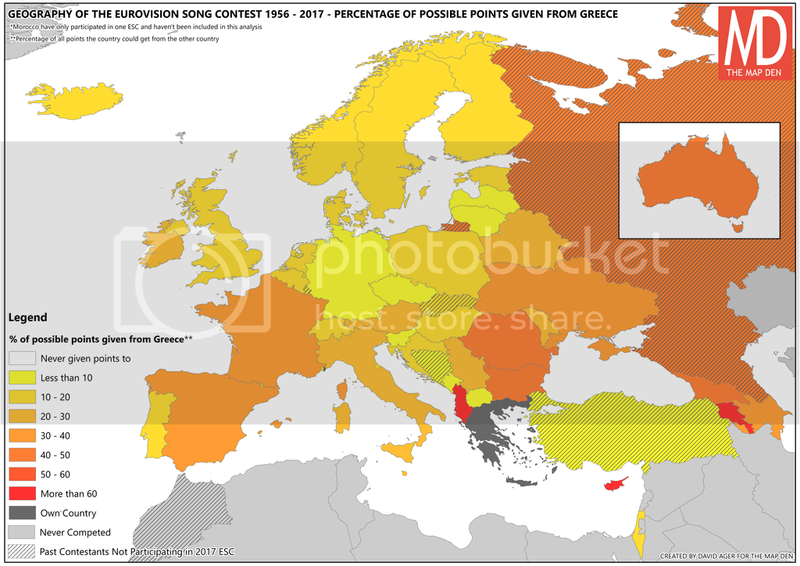 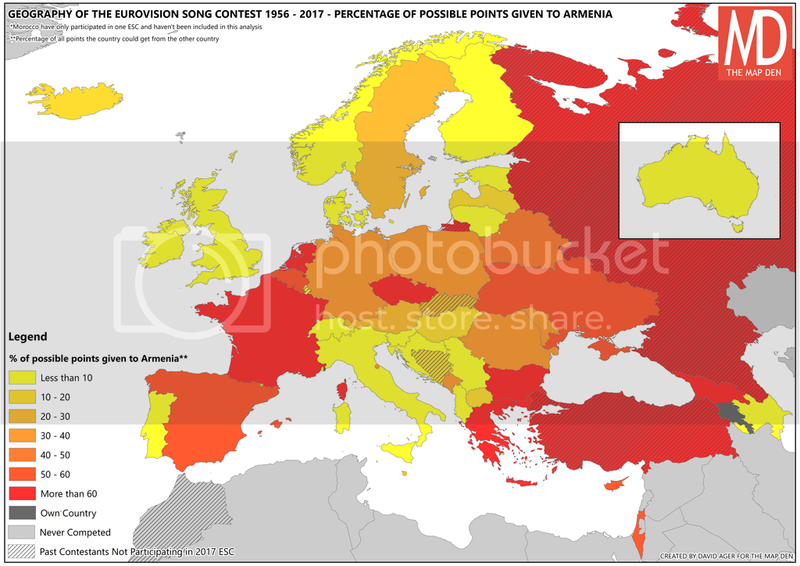 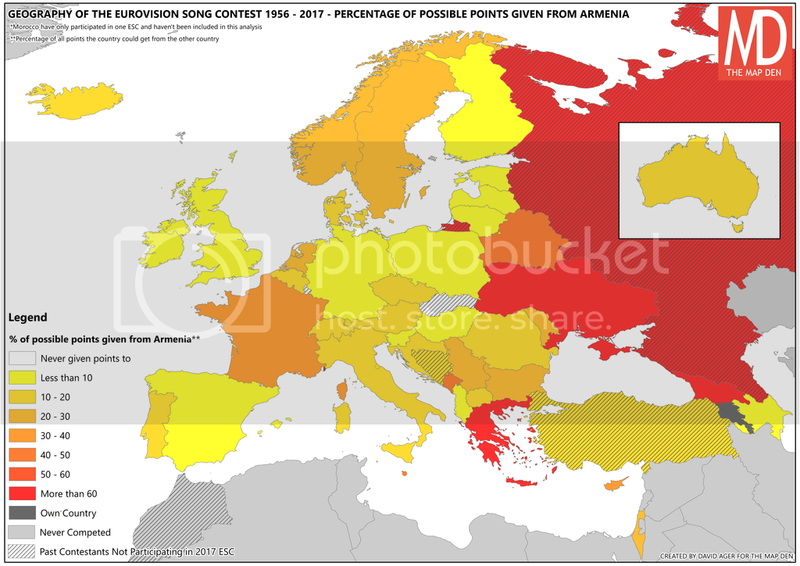 Seasoned viewers are fully aware of what to expect in this annual political geography lesson – Greece and Cyprus will give each other 12 points, Scandinavian countries will vote for each other and Azerbaijan will (probably) never vote for Armenia. 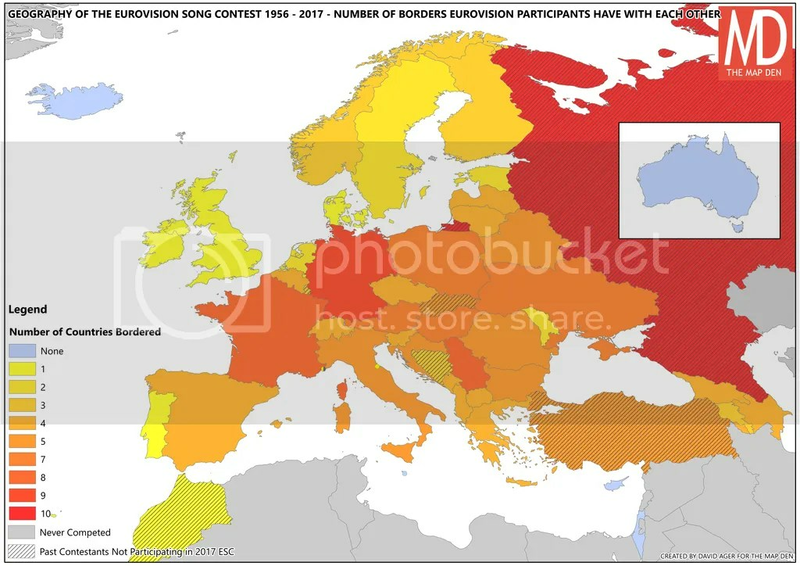 But how true is this? 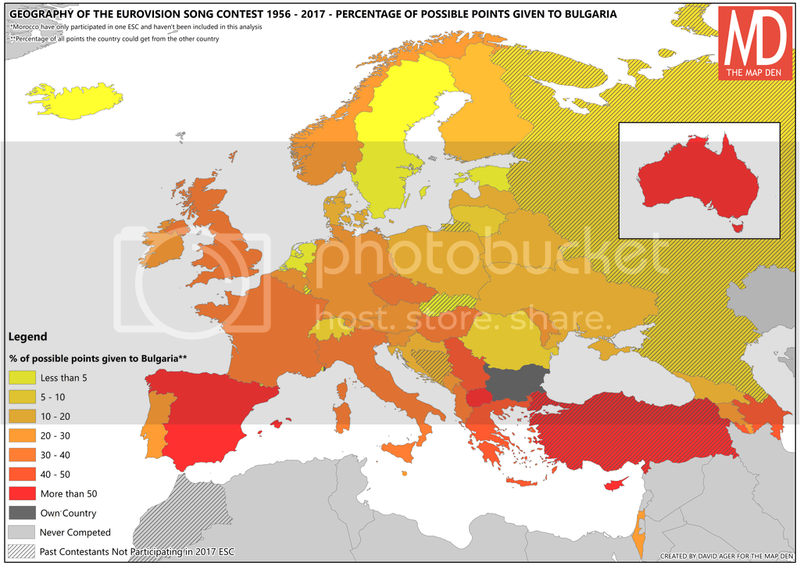 Where can your country hope to get votes from? 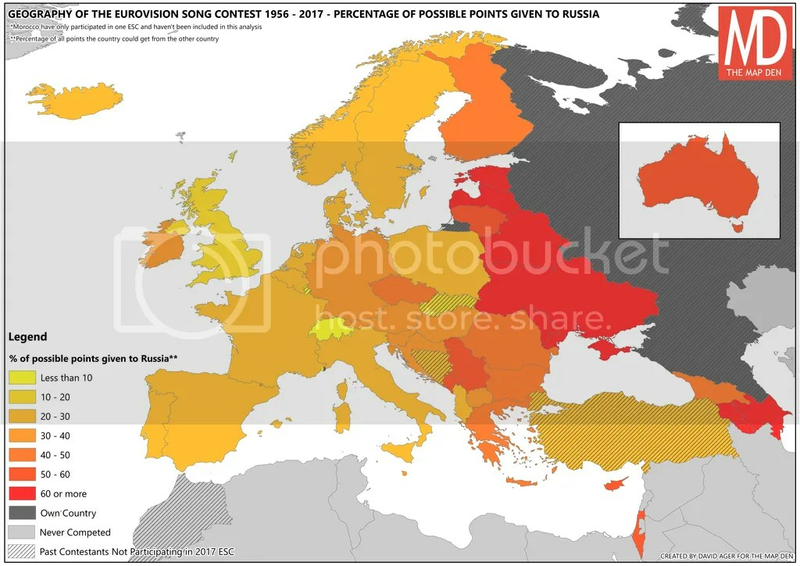 Who will give votes to who? 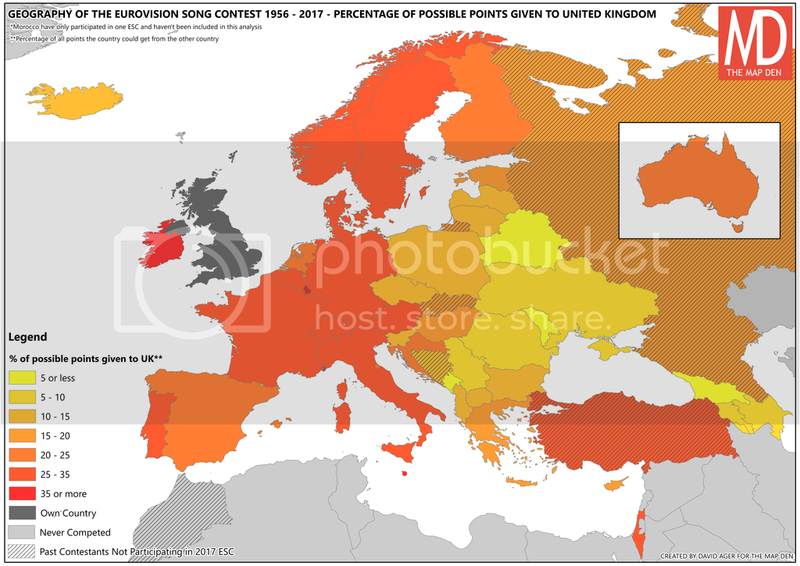 How much are UK struggling? 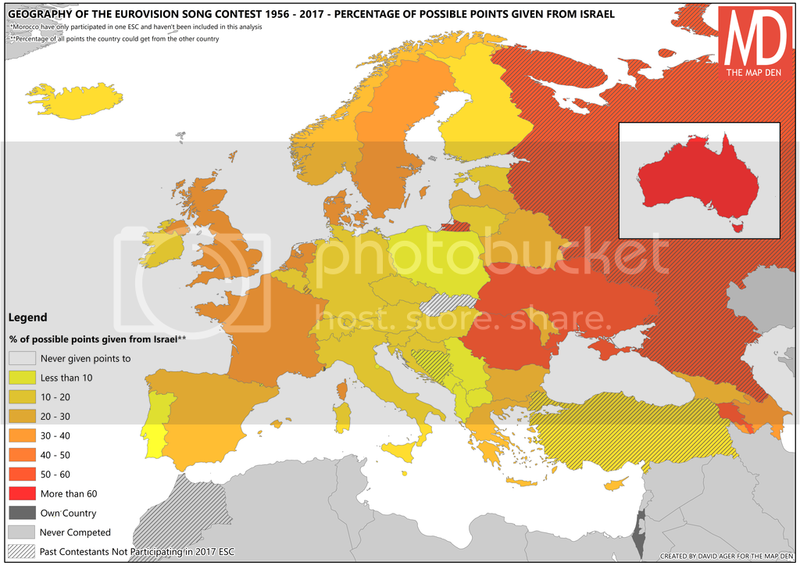 Maps reveal all. 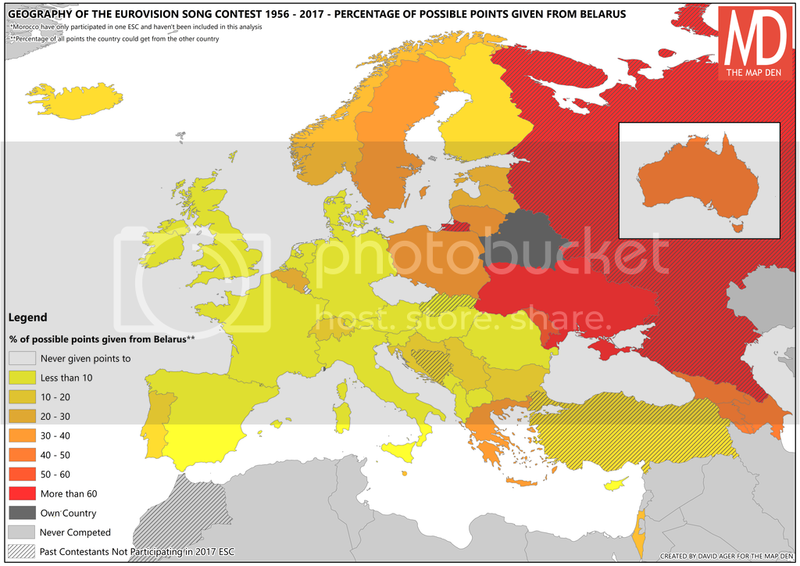 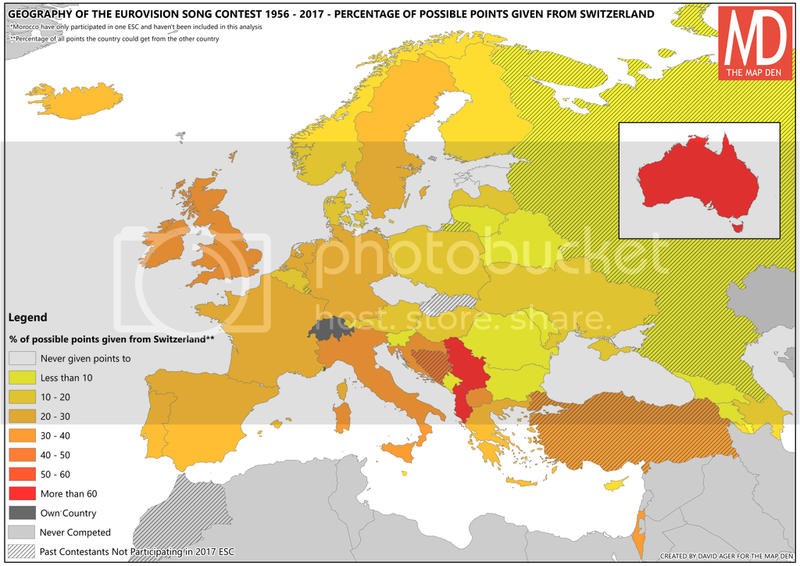 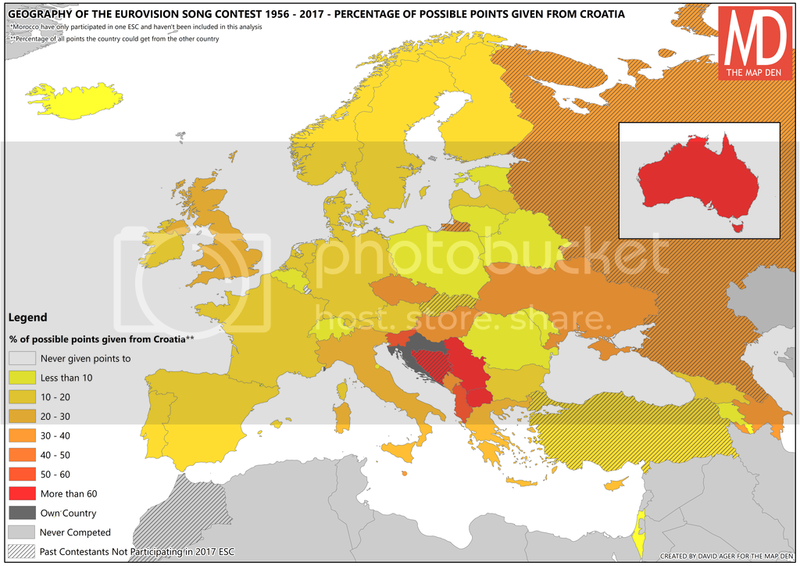 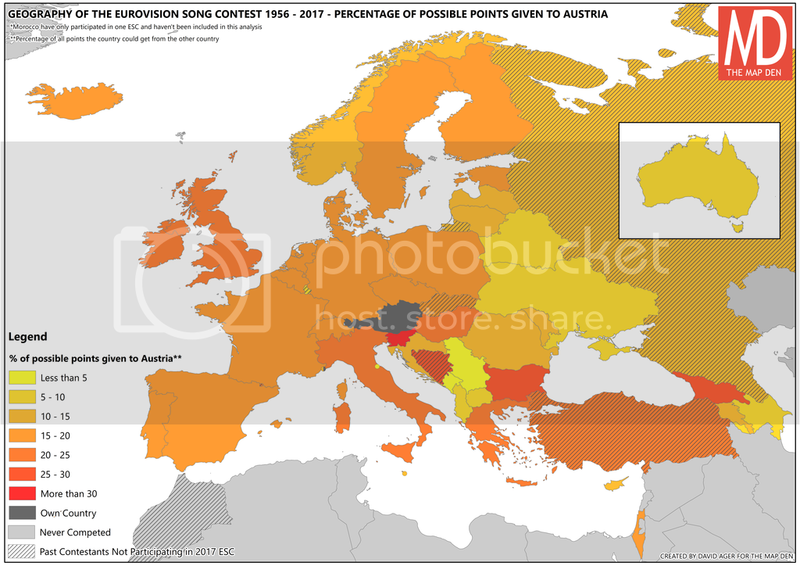 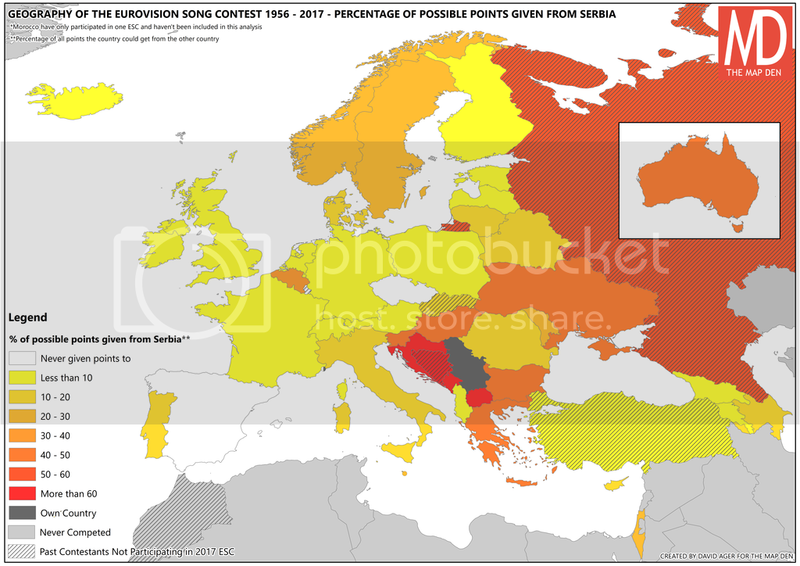 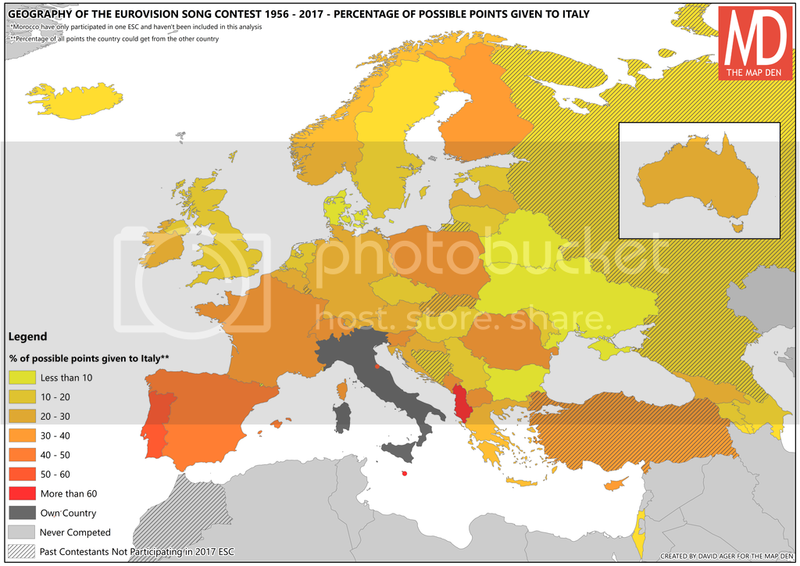 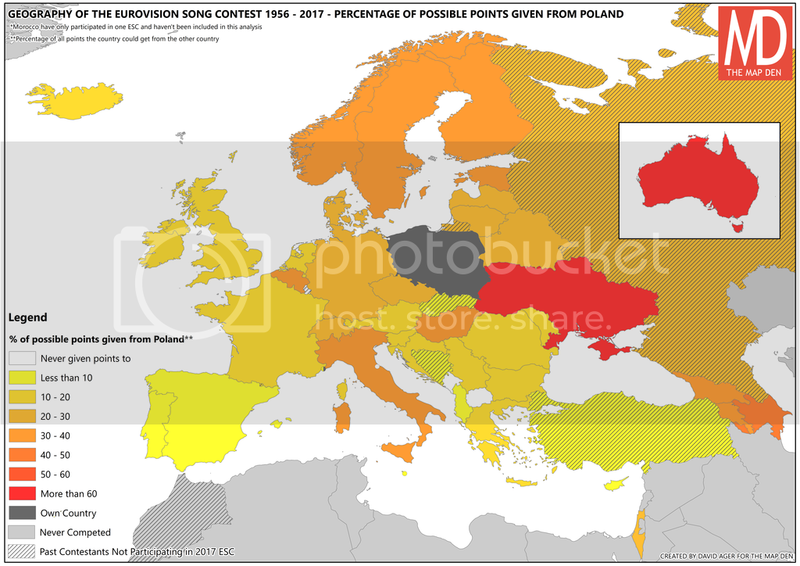 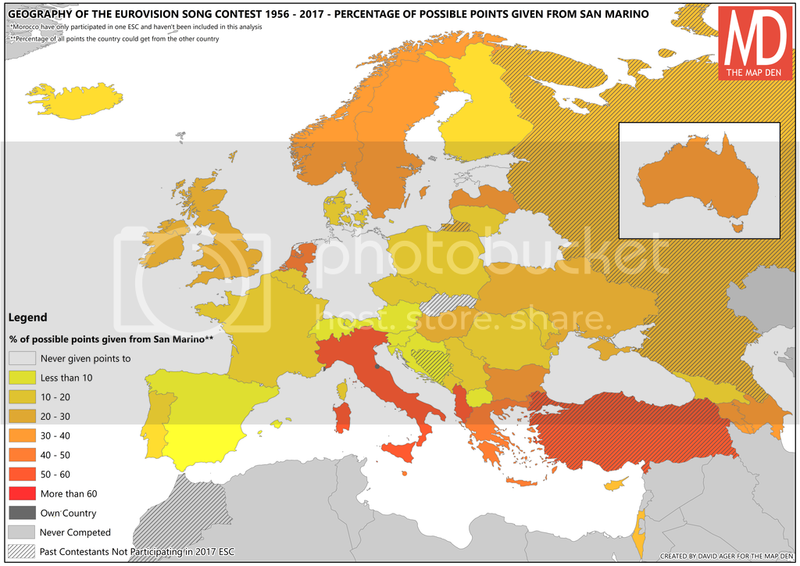 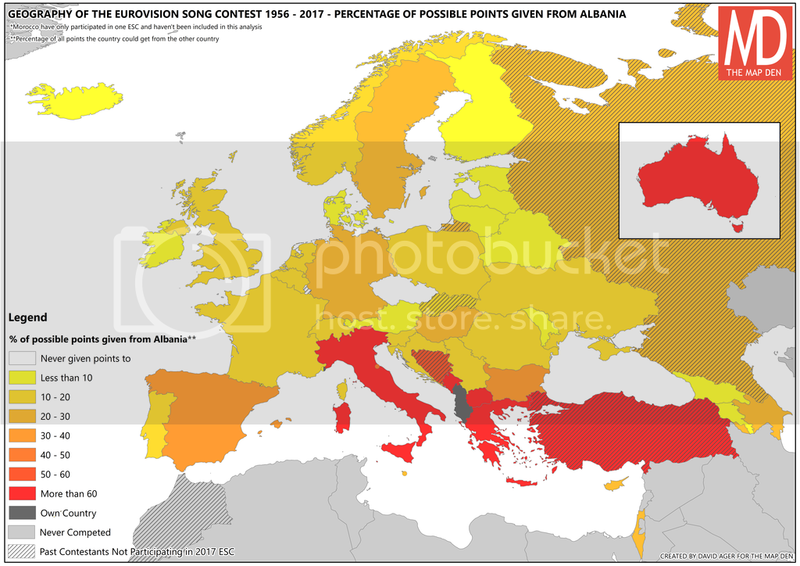 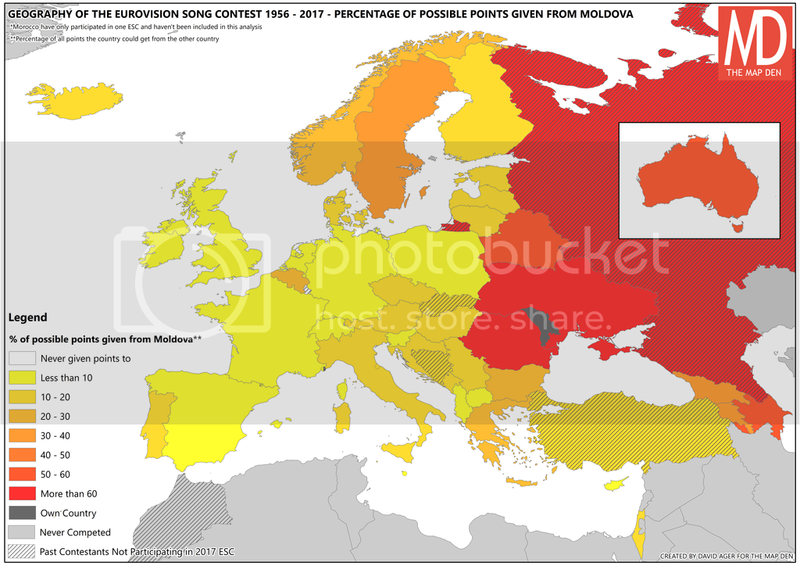 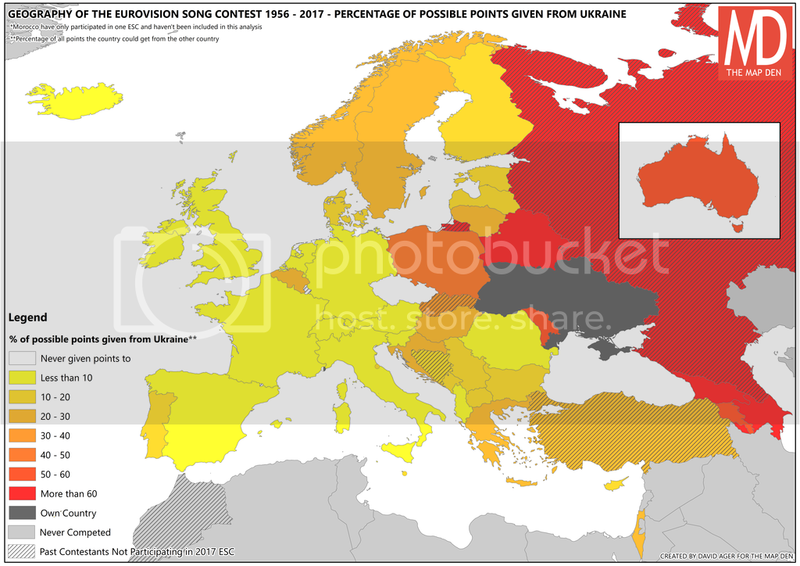 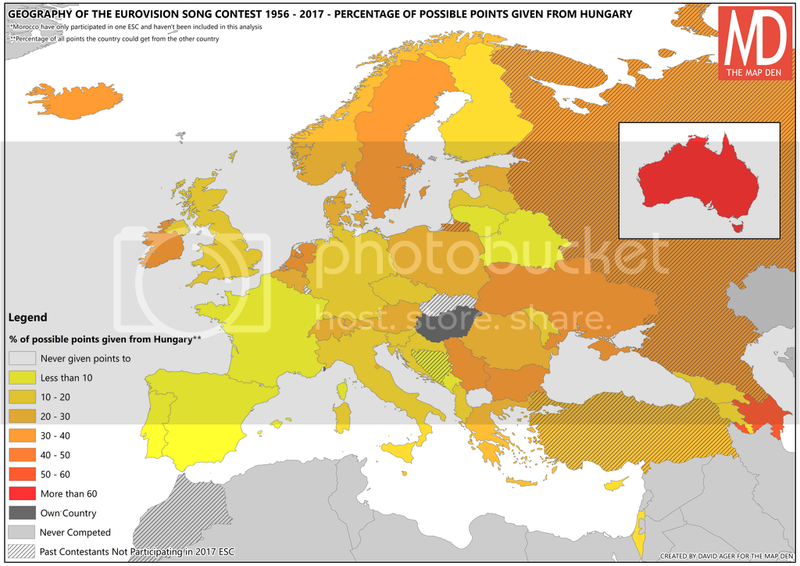 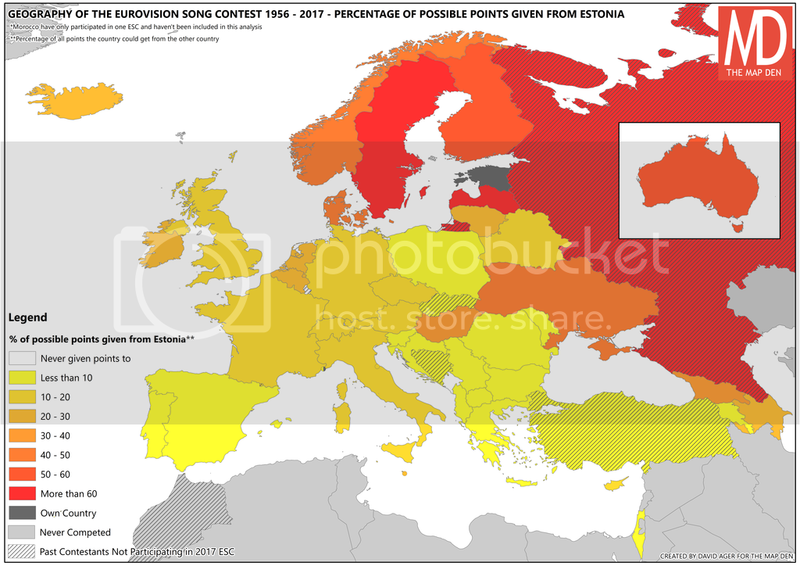 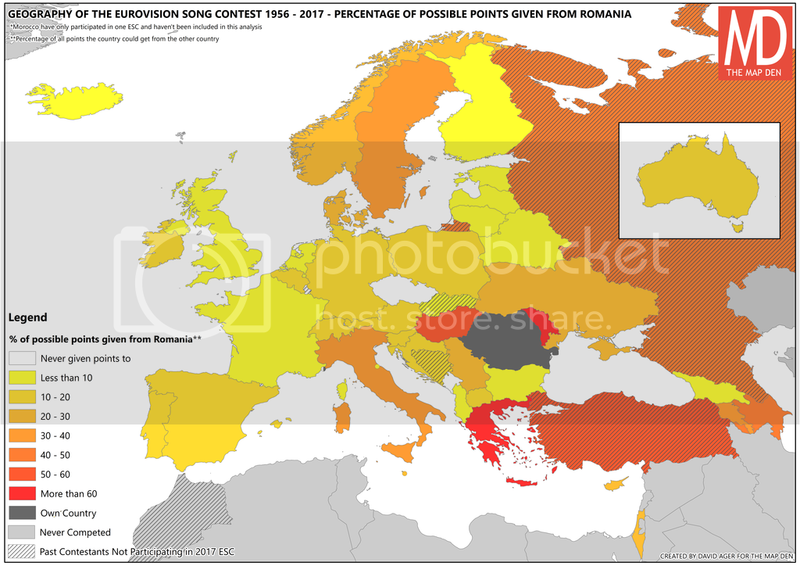 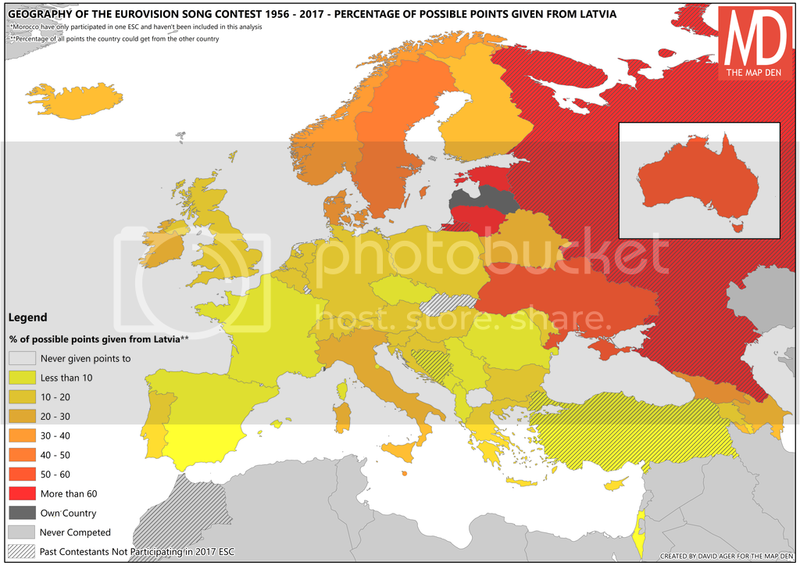 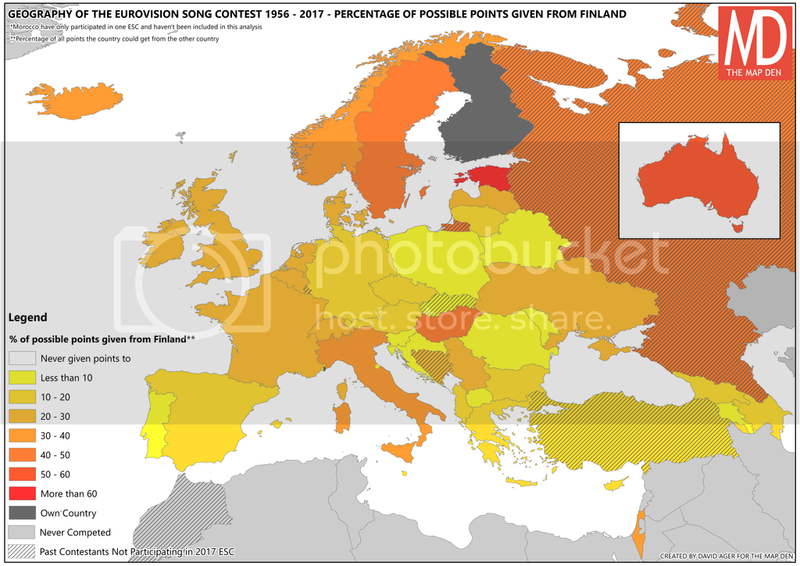 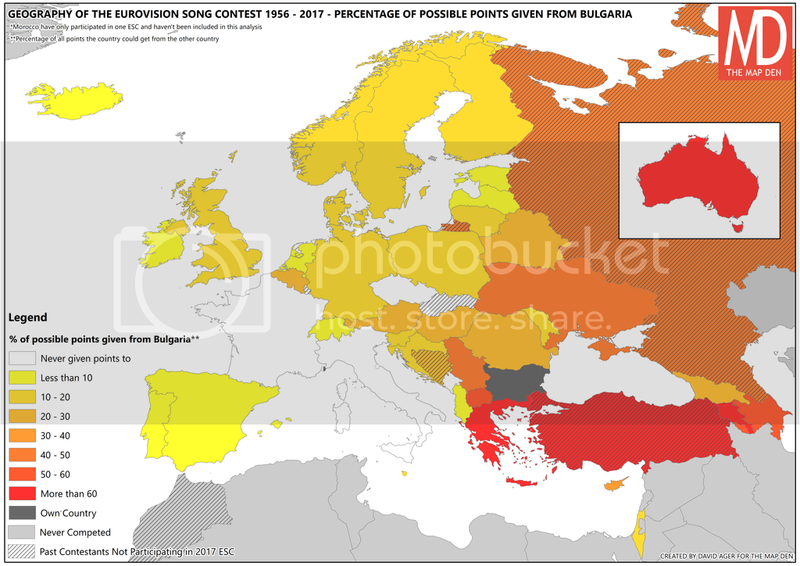 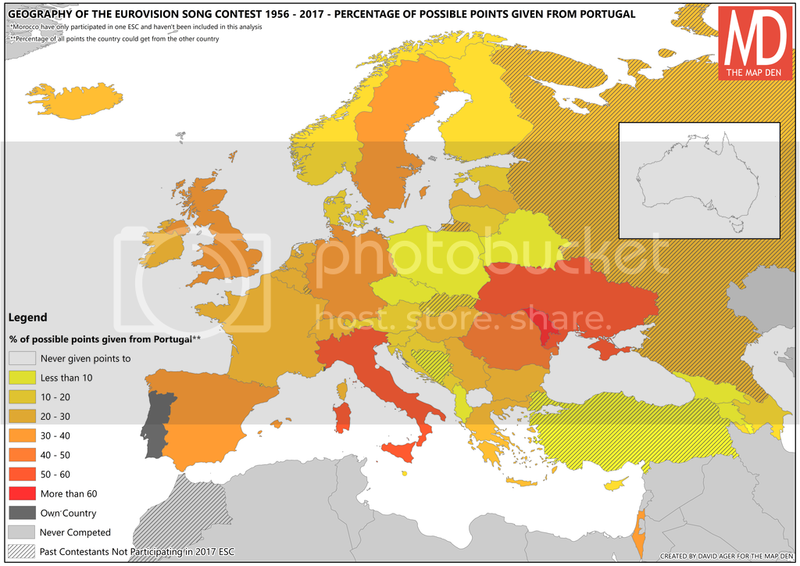 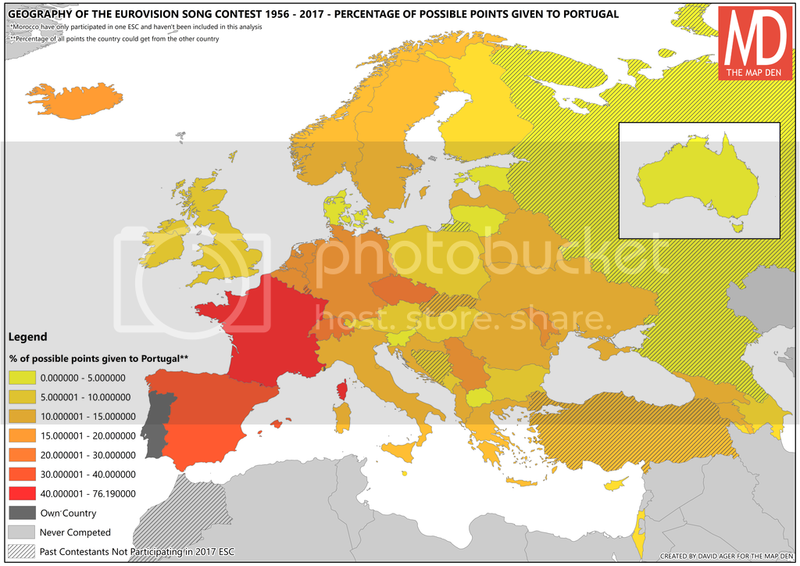 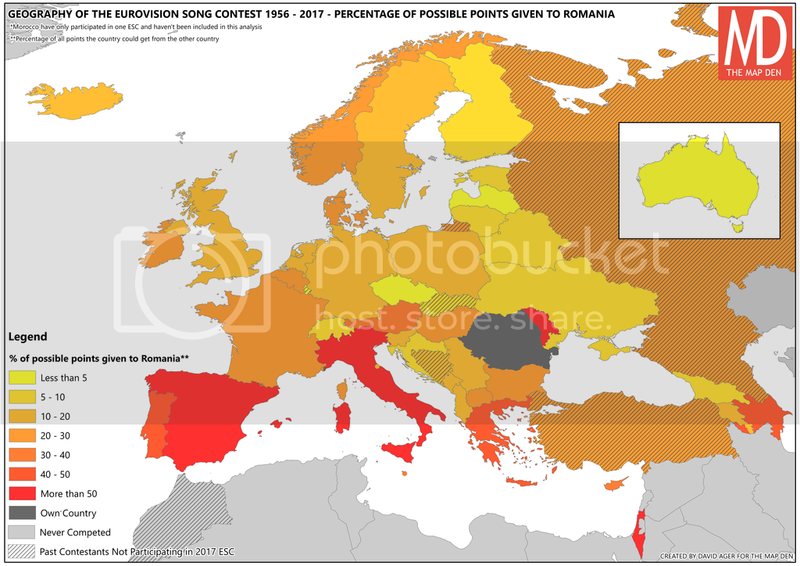 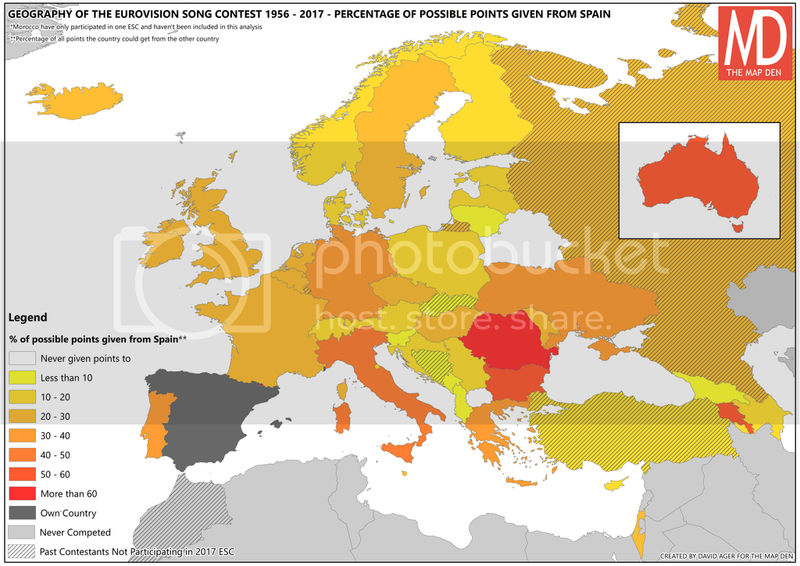 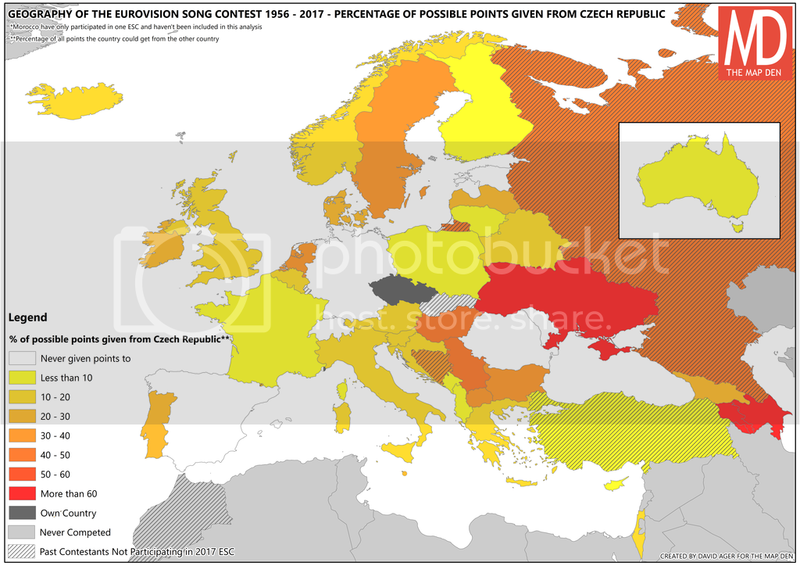 For those watching or getting prepared for ESC 17, you may want to see exactly ‘which country votes for who’, and ‘who receives votes from who’ – maps for each country are available below, which displays how many % of available points have been given or received from another country. 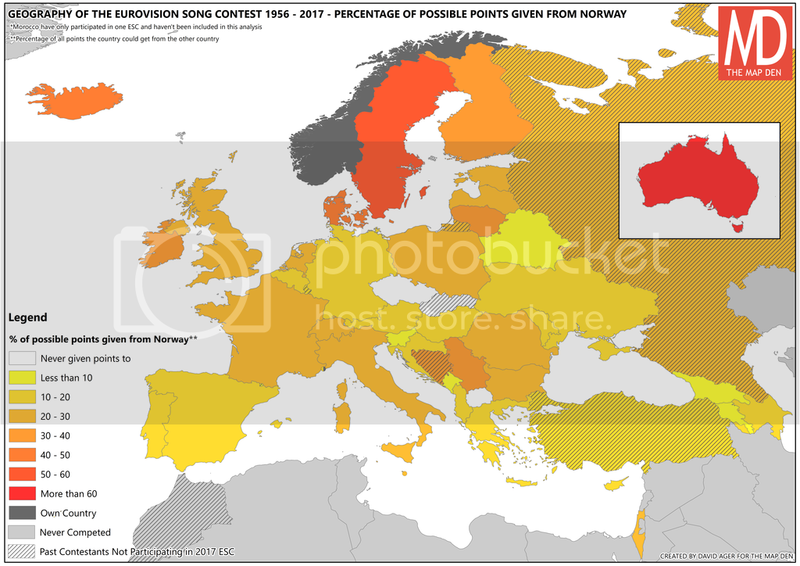 Some results are less conclusive and surprising, others less so. One important caveat is that the more recent entrants, particularly Australia (yes, that ‘European’ country…), may have more exaggerated averages, given the lower rate of entries. 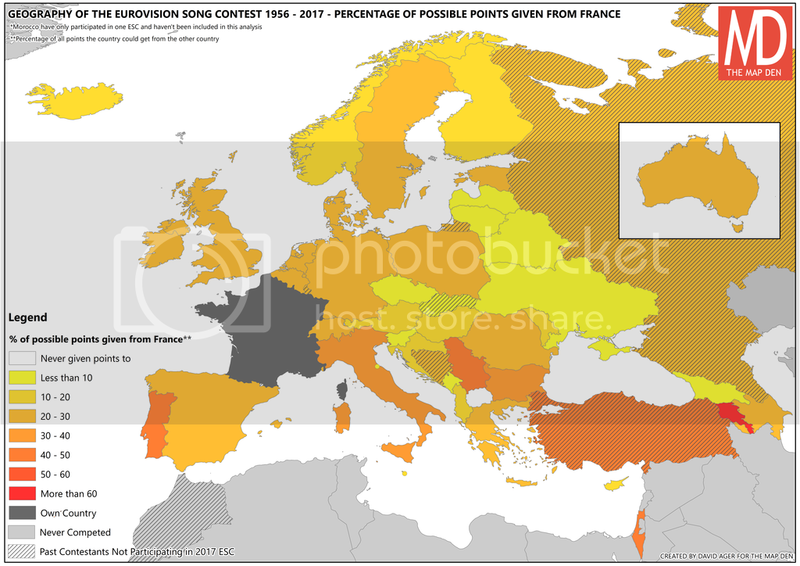 By the logic having shared borders alone, one might expect that countries which share the most borders should have greater voting biases and potentially more success in the ESC. 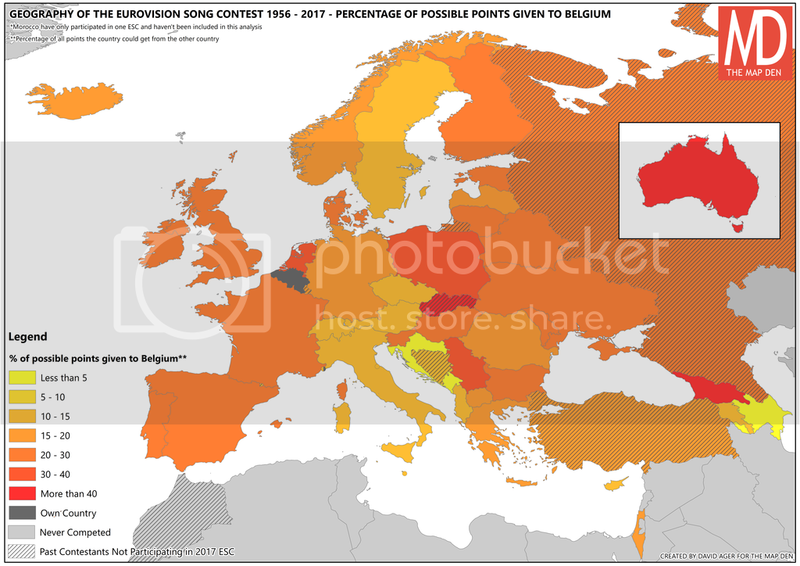 In the map above, you can see that Russia and Germany should be particular beneficiaries of this. However it is more nuanced than this. Scandinavian countries like Iceland, while not having a land border with other Scandinavian countries, will tend to vote more for their fellow Scandinavians. 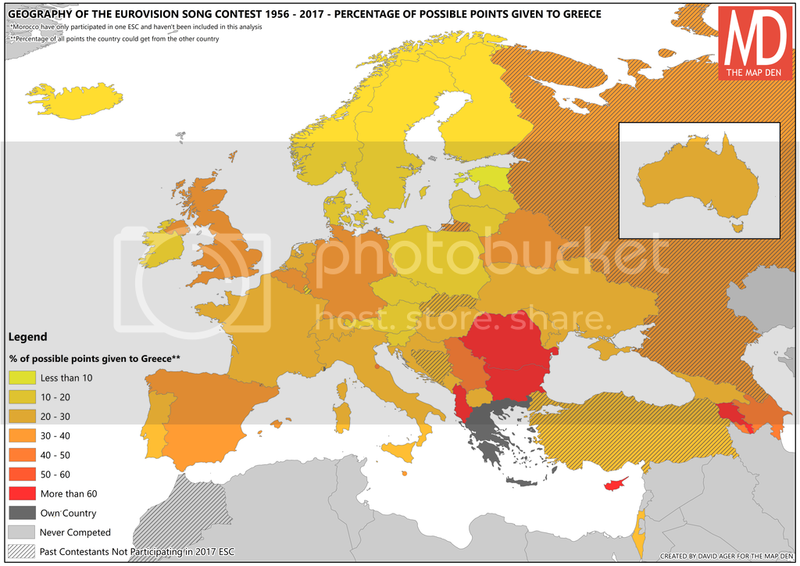 The same is true with Greece and Cyprus, and even more generally between Balkan nations and ex-Soviet countries. 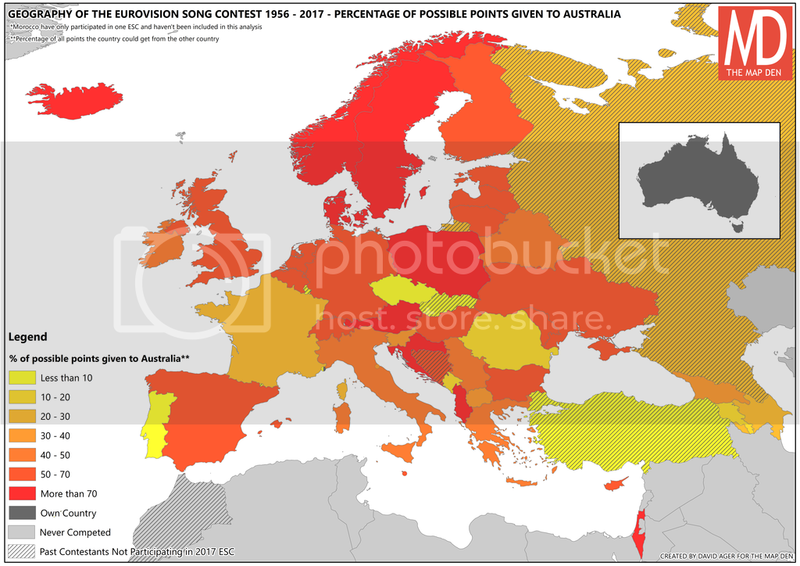 This highlights that while neighbours are important, the cultural geographical ties play an important role, whether in conscious bias or sub-consciously through a particular cultural musical sphere. 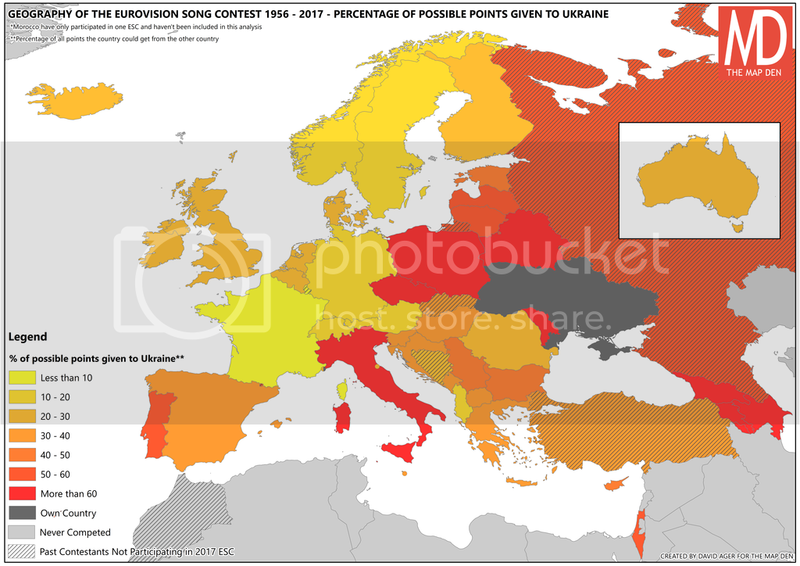 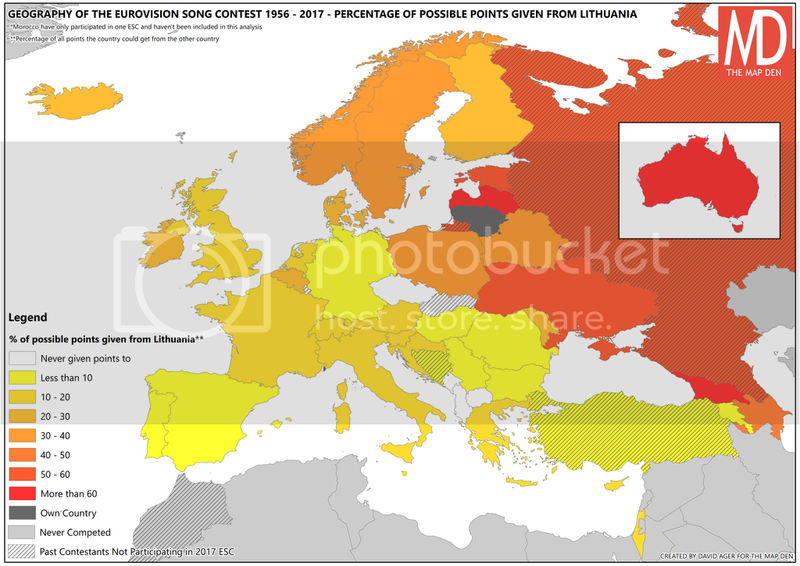 While for Germany, the points given to them not appear to have great geographical or cultural logic, Russia, ironically not taking part this year, have a great geographical ‘pull’ from ex-Soviet countries and generally in Eastern Europe (see below). 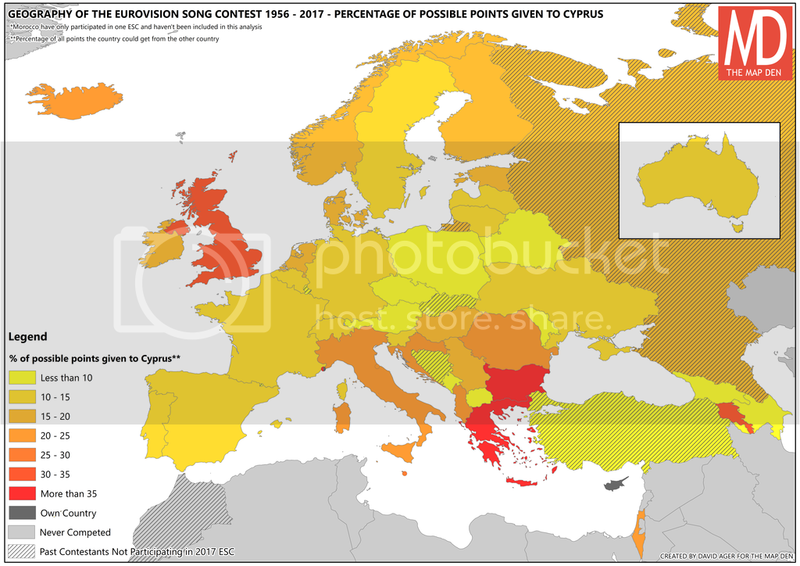 For those interested UK’s prospects, to get to the point quickly, I wouldn’t hold out much hope. 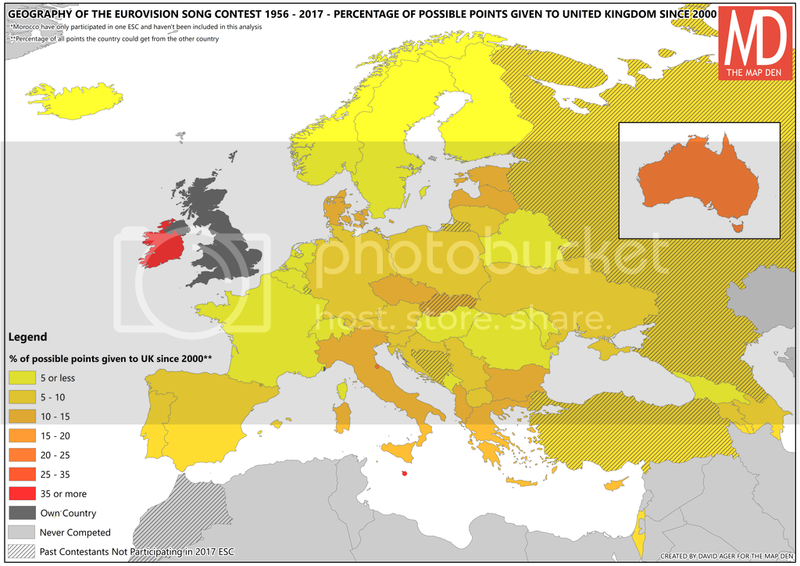 While historically the UK has a relatively strong record in the ESC, it has been a long time since the United Kingdom won in 1997, or really come close to winning. 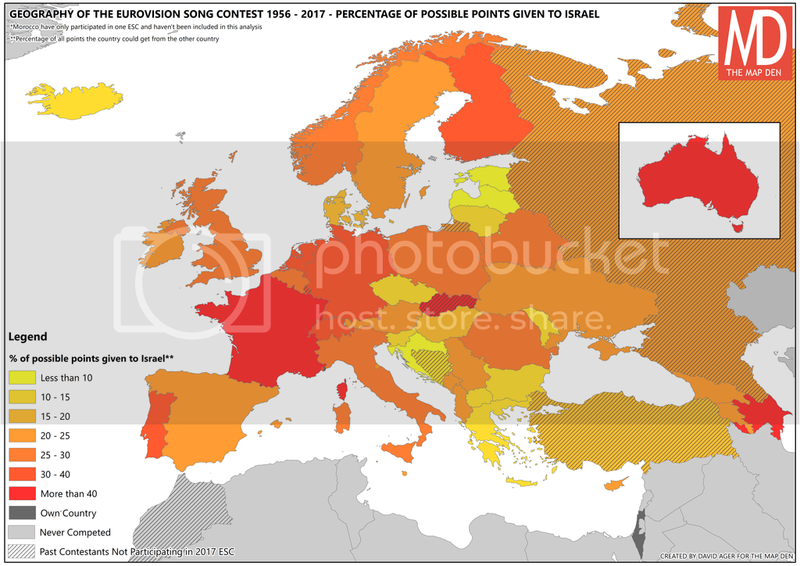 This analysis (see above) has also shown since 2000, the percentage of possible votes has decreased quite significantly. 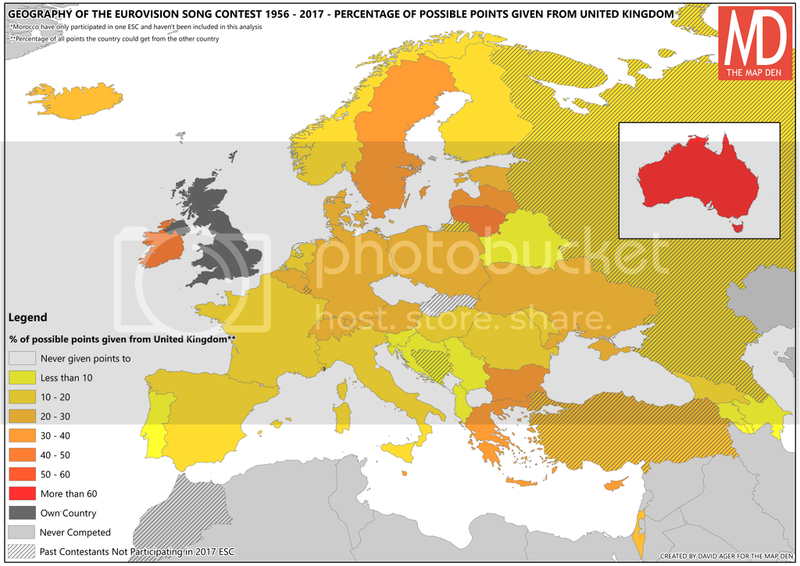 Whether cultural differences, perception of not sending ‘list A’ singers, political influences, or simply not having a good enough song and being drowned out by multitude of countries; post-Brexit UK’s chances are slim. 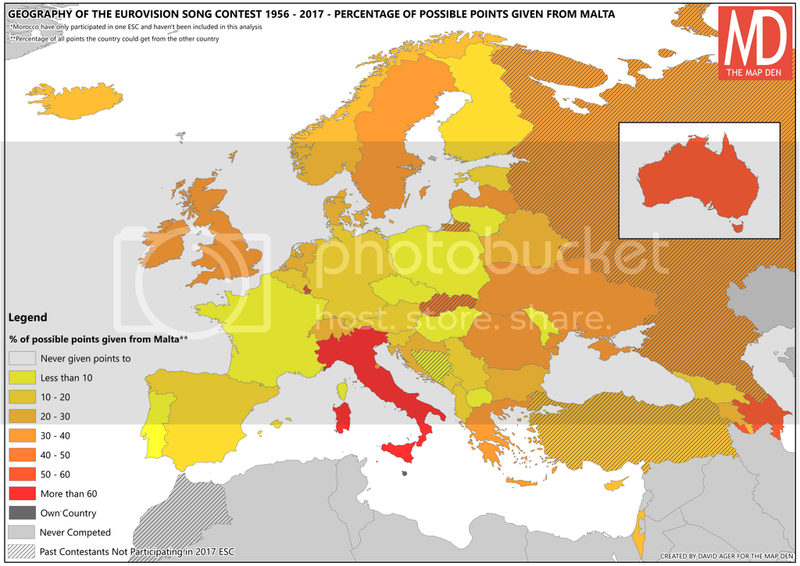 For now, avoiding null point by relying and hoping on Irish, Australian and Maltese votes seem to be UK’s best hope. However there is some hope. 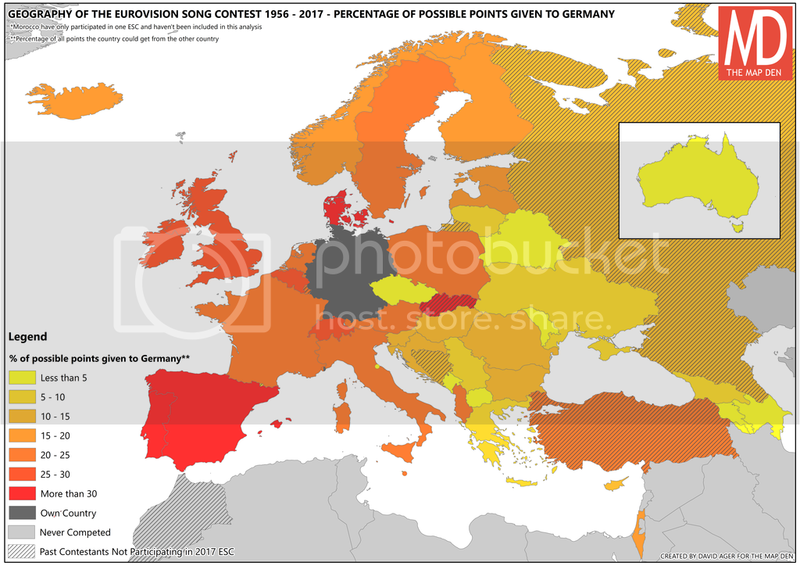 Germany receives a reasonable share of the vote and even won the contest as recently as 2010, admittedly with the best song of the contest. However, this was not always the case, in the early years of the contest World War II was still fresh in many memories, and the map above hints at possible anti-German feeling still persisting in voting patterns in some of the affected countries. 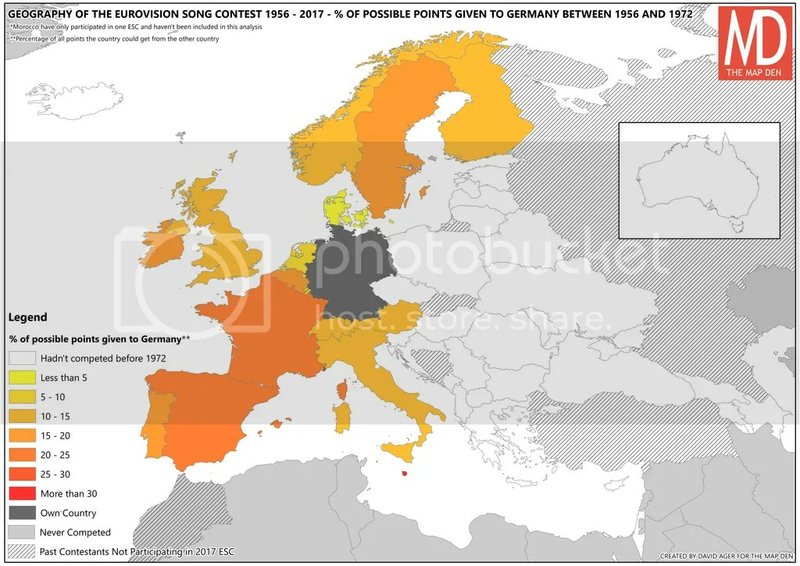 For example, Denmark and the Netherlands are relatively consistent voters for Germany, but between 1956 and 1972 they and many other European countries gave fairly low points to Germany. 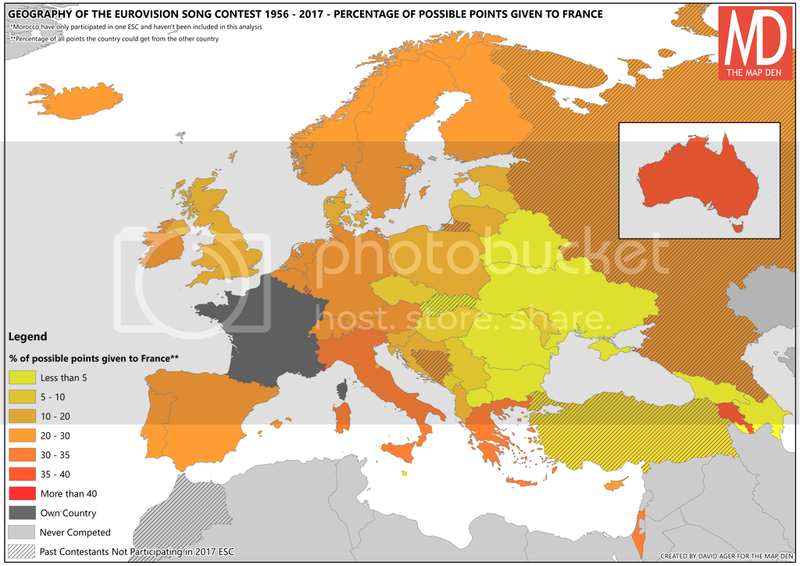 Furthermore, one should note that France have not won since 1977, the Netherlands have been on a barren run since 1975, Spain haven’t had an outright winner since 1968, which was allegedly fixed by General Franco. 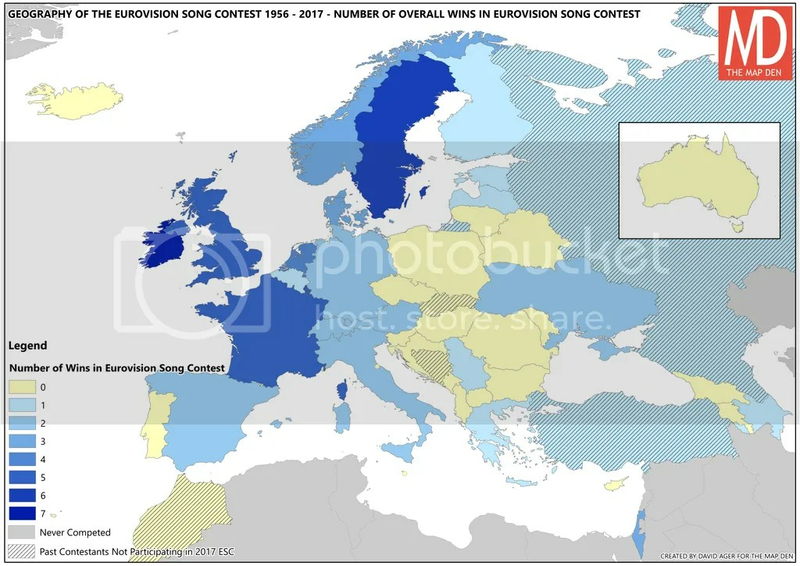 The UK is not alone in having to wait a long time for success. In the meantime, sit back and enjoy, the best song usually wins over the politics. 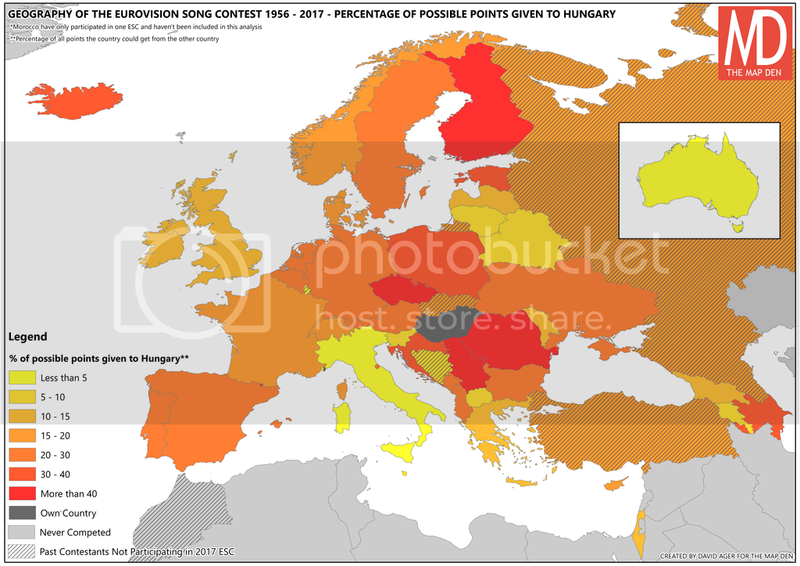 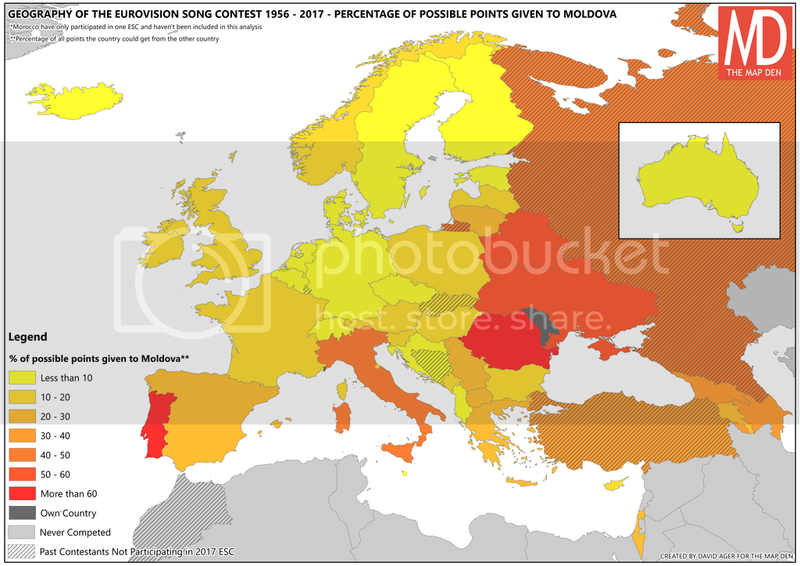 I’ll openly and shamefully say that Eurovision is a highlight of the year and while the ESC can be an interesting political and cultural barometer, I believe there is something in the saying, ‘it’s the taking part that counts’, even in the often bizarre world of the Eurovision Song Contest. 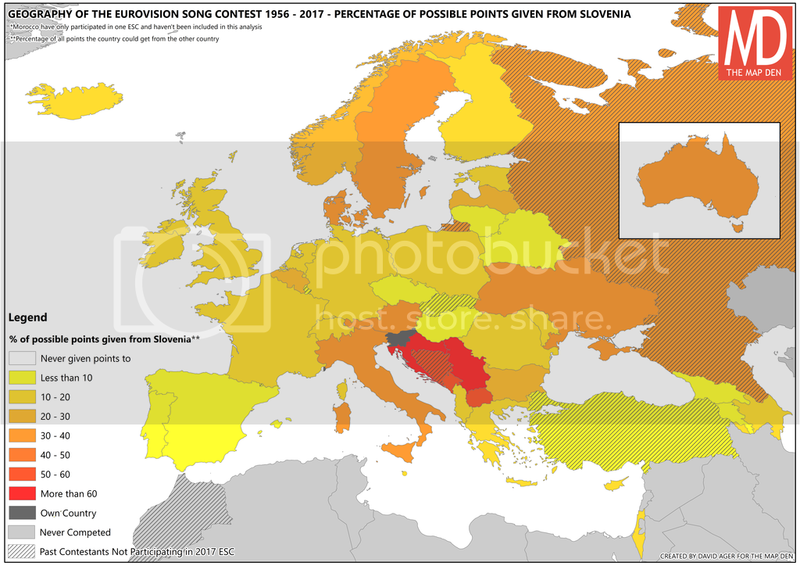 PS: It wouldn’t have been possible to do this without this great ESC database, so data credits to this.